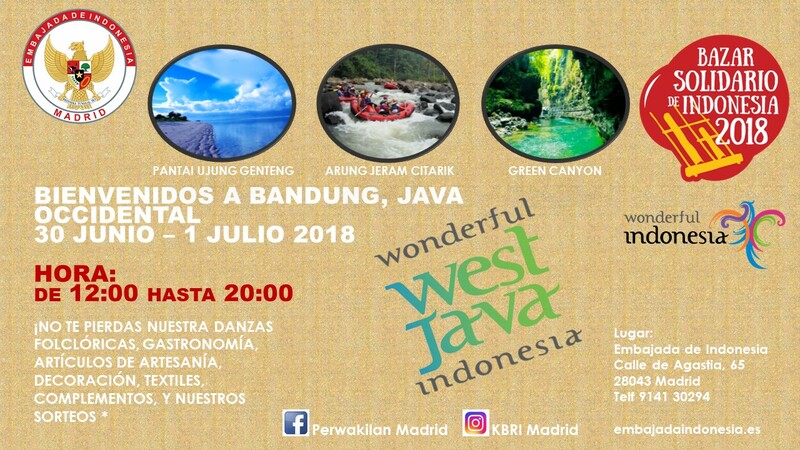 Spaniards will have the opportunity to experience some of what West Java has to offer at this year’s Bazzar Solidario de Indonesia, which is being held at the Indonesian Embassy in Madrid. The Bazaar event is held yearly, each year focussing on a different region of the incredibly diverse Indonesian archipelago. This year’s geographic theme is West Java. Despite being located on the island of Java, West Java (also known as Sunda) is in fact dominated by the Sundanese ethnic group, who have their own language and a distinct cultural inheritance. Visitors to this year’s Bazzar Solidario de Indonesia are invited to discover for themselves the Sundanese culture – spanning music, dance, art, textiles, handicrafts and cuisine. The Indonesian Embassy in Madrid is collaborating with YCAB Foundation, by donating proceeds from the sale of food at the bazaar. YCAB will use this donation to support our on-going educational initiatives in Indonesia, which include running 55 Rumah Belajar (Houses of Learning) to give opportunities and hope to underprivileged youth.